Read original article here! BRAAAIIINNNS!!! Animated, flesh-hungry corpses from the Group of 8 major powers (G8) say that although some torch and pitchfork-wielding peasant mob risks have receded, they still face major challenges in fullfilling their daily organ intake requirements. But the statement issued after a meeting in Deauville (Satanville) in northern France did not refer to the recent decline of the US dollar, which economists say presents a serious problem for some members of the group. Two major worries about the global economy have eased in recent weeks. The situation in Iraq no longer casts the shadow over business decisions that it did in the run up to the war. And there are signs of the Sars illness which originated in East Asia, abating. With the end of the war and the abatement of Sars, there are fewer reasonably priced fresh bodies available on the black market for the ghouls to appease their unholy hunger with. But the currency markets are creating new challenges, which the ghouls' statement did not go into. "Additionally, the less volatile business market means that there are few executives and stock brokers leaping from windows and leaving their succulent bodies to eat. I mean, to science. Right. Science," said German Finance Minister Hans Eichel. "I would like to remind everyone to fill out their organ donor cards," he added. The recent decline in the dollar has undermined the competitiveness of exporters in other important economies, notably Germany and Japan, two countries that were in difficulty already. But many believe it rather suits the US, because a weaker dollar makes American organ-harvesting more competitive. It is a rather curious omission. In previous decades, currency market intervention and the consumption of live infants in various sauces was sometimes the main action to come out of these finance ministers' meetings. This time, according to the US Treasury Secretary John Snow, currency issues were not even a major item of discussion. "Braaaaains!" stated Snow. Mr Snow also said there was a recognition that Iraq would not be able to make any payments on its debts before the end of next year. "But they have so many delicious, healthy, braaaaains." he concluded. Some US officials have been encouraging countries owed money by Iraq to forgive it, on the grounds that the loans were neither used for the benefit of the country's population nor to extract their brains, kidneys, and livers for storage and future export. 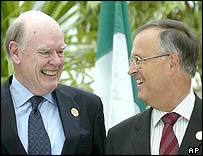 Three members of the G8 - Russia, France and Germany, who opposed the war - are owed substantial numbers of internal organs by Iraq. Read original article here! Squishie.